Time in a very special dimension.Watches are timepieces. Watches are timepieces. Enter the time and the beautiful moments in our lives a very special meaning. Bruno Soehnle watches (based in Glashutte) can not only absolutely precise time, they give the time of their particular aesthetic and technical perfection of a new dimension. Time is perceived differently, time is captured in the moment of looking at this beautiful clock for a moment. Beauty and functionality of the name Bruno Soehnle connecting more than half a century in the art of watchmaking. 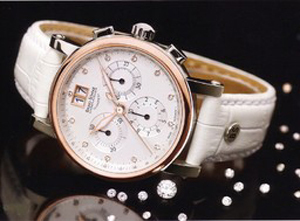 Mechanical watches are collector’s items and value systems. Inside the mechanics editions of Bruno Soehnle refined run and newly-designed manual winding. Bruno Soehnle responsible here Eigenkon various constructions such as the three-quarter plate and the clamp with the swan neck regulator. Automatic – In the heart of the movement suggests a Swiss technology. All boards and anchor bridges are made in Glashutte and refined in Soehnle-Uhrenatelier. The rotor, a synonym for the automatic driving of the transition movement is precise, and developed by Soehnle.